A variety of businesses and industries in Indonesia today require qualified IT experts who are not only experts and very understanding in their field, but also have a strategic and analytical thinking. They are expected to lead and make IT division of the company as a force to win business competitions in the era of globalization. 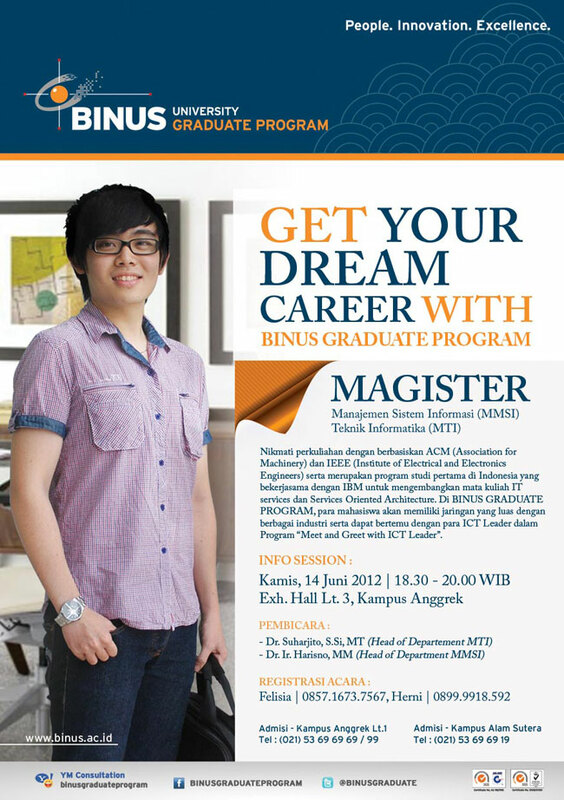 With excellence curriculum aligned with technology development and benchmarking with international standards, BINUS GRADUATE PROGRAM will help to prepare you with the various competencies in the fields of IT and managerial skills that will enable you to emerge as leaders in the future. Open for public and FREE!! Prepare yourself as IT Leader!! Appreciation Day 2013 "Break through the Limits"